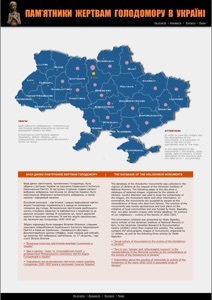 The UCRDC produces documentary films, prepares educational materials, and sponsors lectures, conferences and exhibits on various topics related to Ukrainian issues. It also functions as a resource centre with catalogued archives, oral histories (audio and video), photographs, memoirs and personal archives. ‣ Annotated scripts for this film. The one-hour documentary recounts events in Ukraine on the brink and during the course of World WarII. UCRDC Archive, established in 1988, acquires, preserves, and makes available documentary sources relevant to the Ukrainian Canadian Community. Access to the archival holdings is provided for legitimate researchers, academics and students. Materials available include ─ video and audio interviews, videos, films, photographs, documents, and books. Travelling exhibit about the internment of Ukrainians in Canada, 1914-20, includes full text of the exhibit panels. The groundbreaking oral history project Children of Holodomor Survivors Speak consists of interviews with children of the survivors of the Ukrainian Holodomor (genocidal famine) and is the first such project to address its impact on the lives of the second generation of survivors in the diaspora. We are grateful to the Temerty family for their gift of support which made this project possible. Between mid-1942 and the beginning of 1944 the German prisoner of war camp Stalag 371 in Stanislav (now city of Ivano-Frankivs’k in Western Ukraine) was used to house some 2400 Dutch officers as prisoners of war. 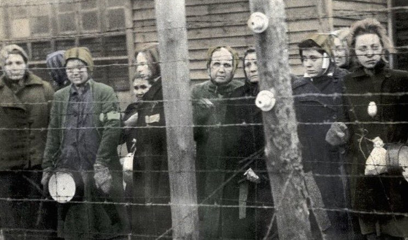 After Germany occupied the Netherlands in May 1940 most of the Dutch officers were taken as prisoners of war and sent to German POW camps in Germany and later on some of them were sent to POW camp in then occupied Stanislav. 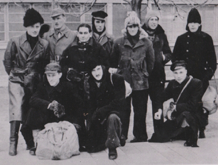 As one of UCRDC’S current projects, interviews with Ukrainians who assisted Jews during the Holocaust bring together insights and first person witness accounts on Ukrainian Jewish relations. These include oral history interviews with Ukrainians who took great personal risks by assisting Jews during the Holocaust, recent perspectives by Ukrainian Jewish leaders, pertinent documents and textual resources. The project explores the shared history of the two peoples and brings to the forefront previously unknown accounts of heroism and survival. We are grateful to the Ukrainian Jewish Encounter (UJE) for support which made this project possible. 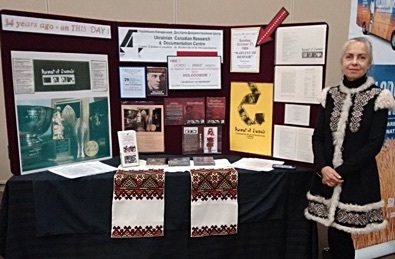 As part of the HOLODOMOR MEMORIAL unveiling event yesterday in Toronto, UCRDC was asked to prepare an exhibit showing its role in starting (in 1982) to research, promote and disseminate information about Holodomor. Two years later, exactly 34 years ago, on Sunday, October 21, UCRDC launched the first documentary film about Holodomor - HARVEST OF DESPAIR , which premiered on that day at University of Toronto, Medical Sciences Building! La Moisson Du Désespoir will be screened in Pessac, France at the FESTIVAL INTERNATIONAL DU FILM D'HISTOIRE. UCRDC continues to produce films, record oral history interviews and collect and digitize important and reliable historical information to ensure that: "The Past is Preserved for Future Generations!" Дирекція, Адміністрація та Добровольці УКДДЦ зі смутком повідомляють, що наша довголітня членкиня та доброво-лець Світлої Пам’яті Д-р Ірена Мороз відійшла на вічний спочинок 18 жовтня 2018 року. Їі вклад в успіх УКДДЦ, а зокрема архіву, були безцінними. Висловлюємо глибоке співчуття родині та друзям покійної. "100 YEARS OF MODERN UKRAINIAN STATEHOOD"
Showcasing interesting historic memorabilia and archival materials commemorating Ukrainian independence over the last 100 years. Includes special series of stamps, banknotes, bonds and postcards issued with the establishment of Independent Ukraine in 1918, many of them created by outstanding artists of the time. Heorhiy Narbut - master graphic artist and president of the Ukrainian Academy of Arts in Kyiv incorporated exquisite Ukrainian baroque ornaments and decorative fonts in his design of the 100 - hryvnia bill released in that year. Exhibit can be viewed Monday to Friday, 10:00 - 5:00 p.m. and will be up until the middle of December 2018. Two students, Olia Kutyshenko and Maryna Vereshchaka, from the School of Journalism at the Ukrainian Catholic University in Lviv, Ukraine arrived at UCRDC for four weeks of research with their research director, Vakhtang Kipiani, on the Ukrainian Division "Halychyna." They will be doing a presentation for the public on Dec. 5th at UNF Hall, 145 Evans Ave. at 7pm. The presentation will be in Ukrainian, all are welcome. UCRDC greets and congratu-lates recently elected President of the Ukrainian World Congress Paul Grod and newly elected President of the Ukrainian Canadian Congress Alexandra Chyczij and wishes them all the best in their leadership endeavours. Оксана Кісь – докторка історичних наук, старша наукова співробітниця Інституту народознавства НАН України, президентка Української асоціації дослідниць жіночої історії. for 17 years, passed away suddenly on January 18, 2019. 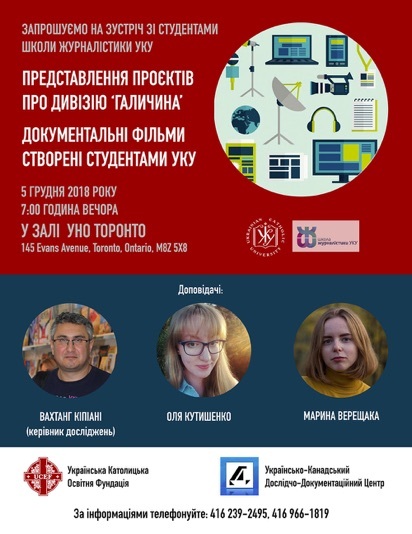 Andrij was Senior Manuscript Editor of the Internet Encyclopedia of Ukraine and research coordinator in the Toronto office of the Canadian Institute of Ukrainian Studies (CIUS). 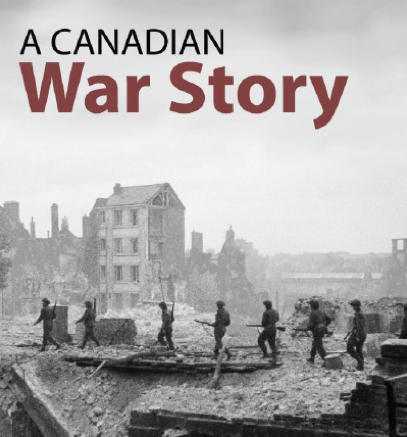 Andrij has been recently very involved in the production of the UCRDC documentary film about Ukrainian contributions to the Canadian military during World War II. Andrij was always available and willing to share his expertise on the history of Ukrainian Canadians. He will be truly missed by everyone at UCRDC as well as the many guest researchers who benefited from his knowledge. Dr. Marta Kebalo, Martha Kebalo, (at centre in photo) is the World Federation of Ukrainian Women’s Organizations (WFUWO | СФУЖО | WFUWO at the UN ) Main Representative to the United Nations Economic and Social Council (UN ECOSOC). She visited UCRDC on Wednesday, March 27. Dr. Kebalo met with UCRDC Archivist Iroida Wynnyckyj and UCRDC volunteers.